Although more compact, HORIZON MINI has the same configuration options as HORIZON. With integration of optics, versatile design, and a large number of light-beam options, HORIZON MINI is small in name only and responds to your needs for, general lighting, highlighting, surface grazing, and many other applications. Offered with a wide variety of accessories, films, and configurations, HORIZON MINI is tailor-made for every detail of your project. 24V: increments of 8” (203 mm). 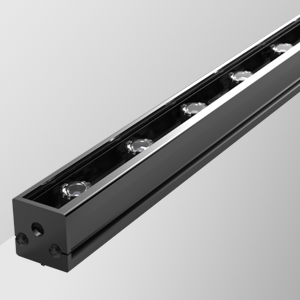 Bracket option PILC allows for an on-site 108° clockwise pivoting and 87° anticlockwise pivoting adjustment. Other anchorings available for different integrations.